Abstract: During the past year or so, there has been a noticeable increase in the sales of DVD-ROM drives. During the past year or so, there has been a noticeable increase in the sales of DVD-ROM drives. 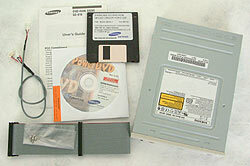 While DVD-ROM drives are not new to the marketplace, they have only recently caught on in terms of practicality and usage for the mainstream PC. Please bear in mind that DVD movies have come down in price as well, to the point of affordability, which might have played a strong part in the surging DVD sales. It's also possible that the spending spree in DVD related gear has been made even more popular by video cards with video output capabilities. With video output features becoming more widely accepted, and standard on newer video cards, it's now quite easy to export the DVD images from the computer to a television set. 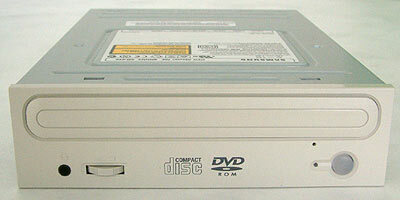 After all DVD-ROM drives are fairly affordable to use in the PC when compared with a standalone set-top version. DVD-ROM's make even more sense for those students who live in residence and on campus, to watch movies inside their tiny dorm rooms. One of the latest drives to make itself know is this offering from Samsung, the SD-616 DVD-ROM. It's one of the newer DVD drives on the market and is rated at a speed of 16x DVD, and 48x CD. To test the SD-616's performance, I have pitted it against one of the most popular DVD units on the market today, the very fast Pioneer DVD-106S, which is also rated at 16x DVD, but with a slower 40x CD speed. In order to gain a good perspective of the new drives and their speeds, I have decided to add my own drive (which has been in regular use for the past 2 years), the Toshiba SDM-1212. This drive is old and rated at a slower 6x DVD / 32x CD speed, but acts as a good reference point to where DVD drives have come from, and for example what might be in your computer. Thanks goes out to both Alfred and Jimmy at Altec Micro for providing the Pioneer DVD-106S slot load drive for this review. The Samsung SD-616 has the standard jumpers in the back of the drive for master/slave/cable select, along with the IDE host connector and the 4-pin power terminal. Alongside those connections in the back of the unit are the regular 4-pin CD audio connector and the 2-pin digital audio output terminal for soundcards and/or MPEG cards which support digital audio features. The packaging and layout are fairly straight forward. The only gripe I have with this packaging is the omission of the 2-pin digital audio cable, which would have been a nice addition. As it stands now, most manufacturers including Samsung, fail to include the 2-pin digital audio cable in their respective retail boxed units as well. The user's guide that is included in the box, is easy to read and has the basic information listed in terms of installation, product features/specifications, and also a diagnostic troubleshooting section.